This year we received a pair of nesting owlets that came to us after the tree they were nesting in was cut down. The very concerned landowner, unaware of the active nest, brought the orphaned young to us immediately after they were discovered. 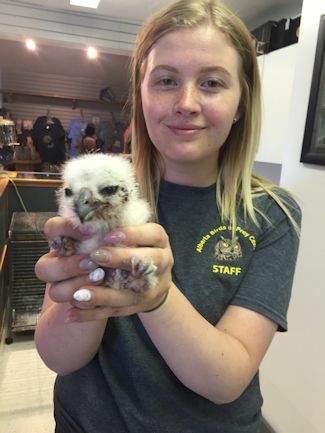 What is truly remarkable is this newly hatched owl arrived at our facility on May 24th, a full 2 months later than normal. Typically Great Horned Owls are known for nesting very early in the year. Here in southern Alberta Great Horned Owls frequently lay their eggs in the cold winter months, often in February. As many people will recall, we had an extraordinarily late winter. Perhaps this late hatching arrival situation was a byproduct of the exceptionally long winter and late spring this year. For us, this very late hatch of a Great Horned Owl was a first in our 40 years of wildlife rescue. But as everyone knows, the climate has been doing some very odd things recently, and perhaps due to climate change there are more extraordinary events in nature yet to come. Many people also don't know Great Horned Owls are more like renters. Instead of building their own nest, they always move into a pre-existing nest left behind by a crow or hawk from the previous summer. They will also sometimes choose very unusual and unconventional locations to nest. We have seen them nesting in abandoned oil well pump jacks, cliff-side caves, abandoned buildings and underneath major highway overpass bridge decks. 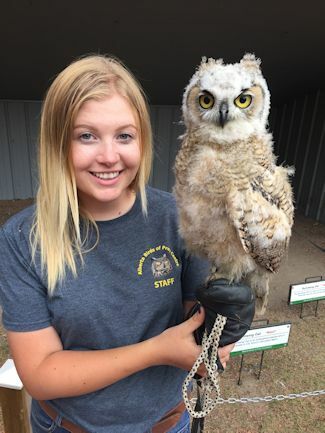 We know of some people who even build nests for Great Horned Owls that have been successfully used. In their search for a pre-existing nest, Great Horned Owls are also very tolerant of human activity, easily adapting to busy urban settings. In addition to nesting in less populated rural areas many choose nest sites in city parks, golf courses, cemeteries, and even residential backyards right beside houses. Locally in Lethbridge, the preferred choice is usually an old crows nest located in a tall fir tree. The added value of a fir tree, is in addition to offering privacy from human disturbance, the thick cover offers valuable shade as owls are not tolerant of heat.